They were gooey when they came out of the oven but after waiting for them to cool down before removing them to the cooling rack, they stiffened up nicely, and then remained chewy for as long as they lasted. I think my swapping out some of the white sugar for brown sugar helped. Also, feel free to use a little less sugar if you like – reviews of the original recipe seemed to indicate that the amount can be flexible according to taste. Cream together butter and the sugars. Then add in eggs and vanilla, mixing well. Blend in cocoa, and then baking soda and salt. From dough, make balls about the size of a rounded teaspoon, place 1.5 inches apart on ungreased cookie sheet. Slightly flatten each ball. Bake at 350F for 8-9 minutes. 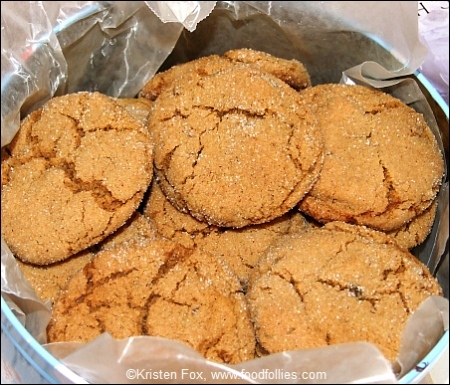 Cookies will be gooey when you pull them out of the oven – let them sit in the cookie sheet for at least five minutes before using spatula to remove them to the cooling rack. We’ve only started to delve into all of the deliciousness promised in this cookbook, but even just on these cookies alone I highly recommend it! Click on the cookbook below to go to amazon and check it out in greater detail! This is an awesome recipe – just mix everything all together, and you don’t even have to grease the pan! Mix all ingredients. Pour into a 9X13 inch pan, bake at 350 degrees for 25 to 30 minutes. Place in a large bowl: flour, margarine, yolks, sour cream, and vanilla. Cut in (as for pastry mix) well and chill overnight. When ready to bake, divide dough into eight parts. Roll each part onto a board dusted with confectioner’s sugar. Cut into 8 or 12 wedges. Then beat the egg whites until fluffy; gradually add sifted confectioner’s sugar. Fold in vanilla. Brush rolled dough with egg mixture. Sprinkle with sugar and cinnamon. Roll each wedge loosely (starting at wide end). Brush rolled slices with egg mixture and cinnamon and sugar. Place on greased cookie sheet in oven at 400 degrees. Bake for 10 to 12 minutes or until golden brown. Supposedly, this serves about 30 people. In the New York City area they are called Black & Whites and have chocolate and vanilla icing on them, but in upstate New York, where I am from, they are called Half Moon Cookies and have more of a traditional frosting than a hard icing. Anyway, I’ve adjusted the recipe we have on our site, which originally came from the New York CookBook. 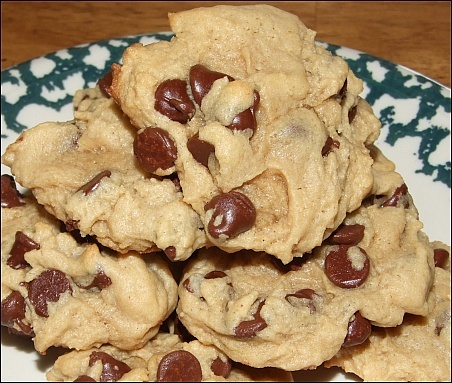 Basically, the changes are… instead of 2.5 cups of cake flour and 2.5 cups of all purpose flour, I found that 4 cups of cake flour and 1 cup of all purpose flour make for a much lighter cookie, but still with excellent consistency. They were just too dense and heavy before with so much of the regular flour. Also, instead of the 20-30 minutes of cooking time, I suggest 12-15 minutes MAX. I don’t even know where they got 20-30 minutes – if I left them in that long at the suggested temperature they’d be dark and crispy, and not in a good way. 12 minutes at 375 in our oven works just fine. Preheat oven to 375. Butter two baking sheets and set aside. In a large mixing bowl, combine the sugar and butter and mix by machine or hand until fluffy. Add the eggs, milk, and vanilla and lemon extracts and mix until smooth. In a medium bowl, combine the flours, baking powder and salt and stir until mixed. Add the dry ingredients to the wet in batches, stirring well to combine. 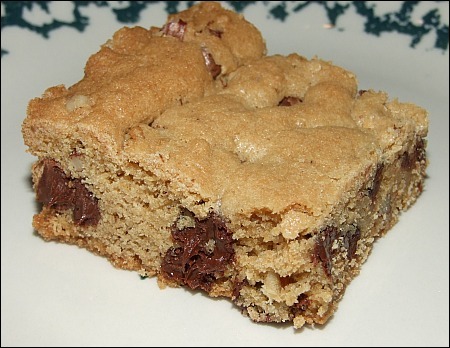 Using a soup spoon, drop spoonfuls of the dough 2 inches apart on the prepared baking sheets. Bake until the edges begin to brown, 12 to 15 minutes. Allow to cool completely. Note: Frost flat side of cookie, half in chocolate, half in vanilla – can use your favorite frosting recipes, although some prefer more of a glaze or icing than a frosting. Oh, and that photo of the Half Moon Cookies up there is an older photo. I did make a successful batch a day ago, but just as I was mixing all the dry ingredients we lost power for a few hours. 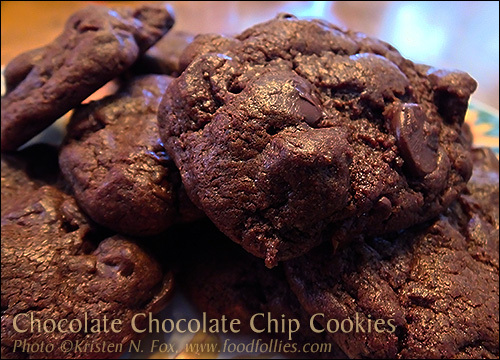 It was after 8 p.m. when we got power back, and by the time the cookies were mixed and baked and ready for frosting I was really tired so I only did chocolate frosting on them – LOL – making them, effectively, just new moon cookies, I suppose. So that’s why I didn’t take new photos – but they came out just perfect with the recipe adjustments – deliciousness! Okay, not exactly inverse, but it made for a decent post title! 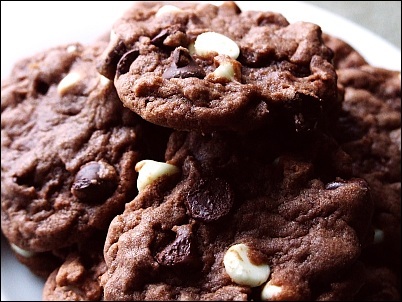 I took the basic recipe we have for Chocolate Chip Cookies but used chocolate pudding and a mix of white and semi-sweet chocolate chips instead…. Excellently tasty, and a nice change from the usual! It’s holiday time, so I’m starting to pull out recipes I usually only make this time of year. (For no other reason except that it’s nice to have some recipes for special occasions.) 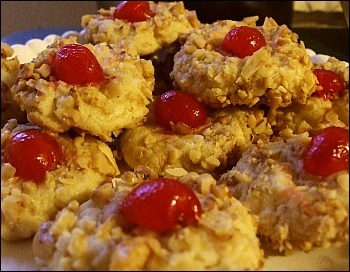 I started with Cherry Cookies, since I haven’t made those in a LONG time, and they look so darn festive – covered in chopped walnuts with a cherry in the center! In small bowl combine flour, baking powder, and salt. In large mixer bowl beat margarine and sugar until light and fluffy. Add egg yolks, dry ingredients and vanilla. Mix well. Chill dough 30 minutes. Preheat oven to 375 degrees. Grease 2 large cookie sheets. Place chopped nuts in one small bowl and egg whites in another. 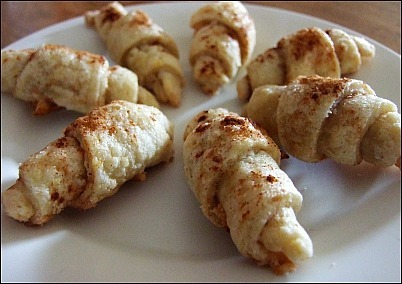 Roll dough by the teaspoonful into balls, flatten slightly, dip in egg whites, then roll in nuts. Place on cookie sheets. 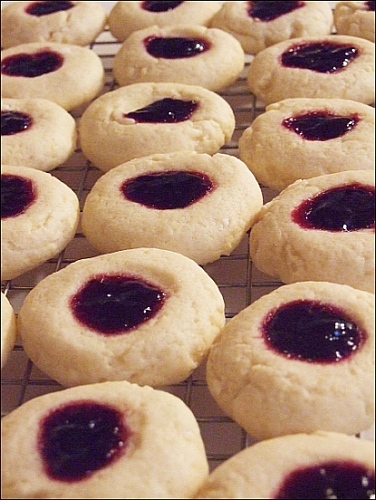 Press cherry half into center of each cookie. Bake 12 minutes. Cool on wire racks. Makes about 54.